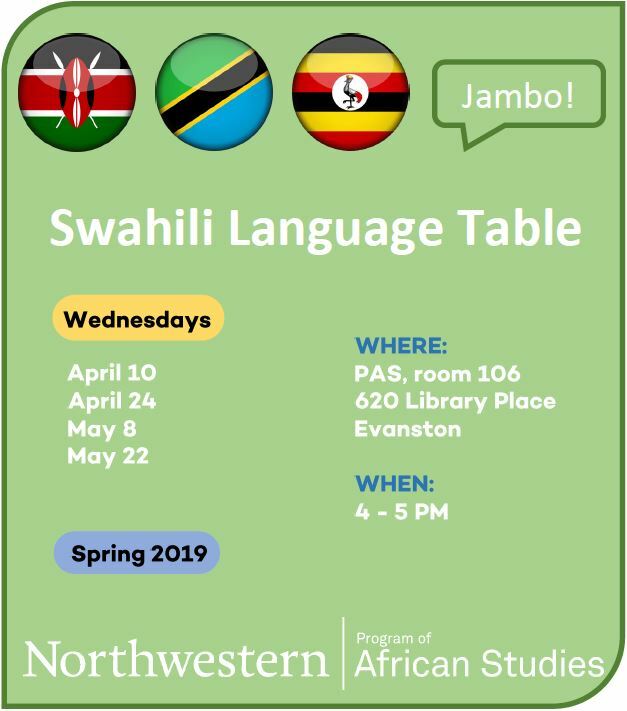 Every year, Northwestern offers courses in Swahili, one of the most widely spoken languages on the continent. To see which courses we currently offer, please see our current course list. This is the beginner's Swahili class and is open to undergraduate and graduate students. There are three courses in sequence from Fall to Spring. The course presents the essentials of modern Standard Swahili grammar while proficiency in the language is developed. The expectation is that by the end of the first year, a diligent student will be able to acquire ACTFL "novice mid" to "novice high" oral proficiency along with basic literacy skills (see Foreign Language Annals Vol. 33, No.1, p. 12-18 for ACTFL descriptors). The course is organized on the national standard first-year text, Swahili: A Foundation for Speaking, Reading, and Writing, by Thomas Hinnebusch and Sarah Mirza. A significant amount of work for the course involves accessing the class's dedicated Blackboard website and interacting with multimedia resources there. Students will perform some course assignments, take some tests, interact with digital audio and video files, and create a personal webpage within the Swahili I Blackboard site. Swahili classes are taught by Professor Peter Mwangi. Peter Mwangi holds a Ph.D. in Higher Education and Student Affairs, M.Ed. in Educational Administration, and M.A. in Applied Linguistics from Ohio University. Peter obtained his B.A. in Swahili from Moi University, Kenya. Peter’s general research interest area is in current trends in global higher education. He is currently researching on the impact of the Less Commonly Taught Languages (LCTLs) on the internationalization of higher education in the U.S. Peter has previously held various Swahili teaching positions at the University of Kansas, Ohio University, Indiana University, University of Oregon, and University of Virginia.